3mm Carbon Fibre plate pre drilled to take a range of gimbals, and fitted with four lightweight quick release clamps for quick removal or swapping of gimbals and other payloads. The clamps are custom CNC cut from high grade aluminium, are self locking and operated from either thumb screws or hex bolts according to preference. Both options are supplied. 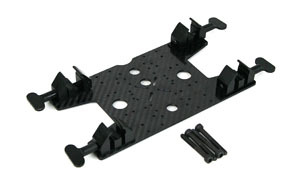 This quick release mount is designed to be used with the Vulcan 12mm rail mounting system.